“Arcadia” is a reference to ancient mythology: “The Garden of Olympus”, “The City of Knossos”, “The Ancient City or The Garden of Alcinous”, “The Path of Ancient Roses” – a reminder of the oldest known roses of the Greeks and Romans, “The Garden of Dionysus” and “The Garden of a Thousand and One Nights”. The “Romantic Gardens” are exotic in style and were laid out to the south of the house, which was erected in 1836. Novalis, the creator of the “blue flower” – the symbol of Romanticism – provides the introduction to the “Garden of the Blue Source”. The “Valley of Poets” is inspired by Victor Hugo while Baudelaire is the inspiration for the “Garden of Exotic Fragrances”. The third area is more recent and is home to compositions which embody the garden’s future. This area heralds the twilight period of life. Among the gardens here are the “Garden of the Setting Sun”, the “Garden of Dreams on a Summer’s Night”, the “Altar of Evening Harmony”, the “Garden of the Red Moon”, the “Garden of Starry Nights” and the “Garden of the Old Oak Tree”. The Botanical Garden of Haute-Bretagne is a contemporary creation located in a 25-hectare landscape garden dating from 1848. The gardens are divided into three areas which refer to spring, summer and autumn. The Path of White Pearls consists of five enclosed spaces for which the garden designer composed five maxims which he regards as essential aspects of garden design. The Garden of A Thousand and One Nights is inspired by Moorish water gardens. A canal flows through it, at the far end of which stand three tall cypresses. 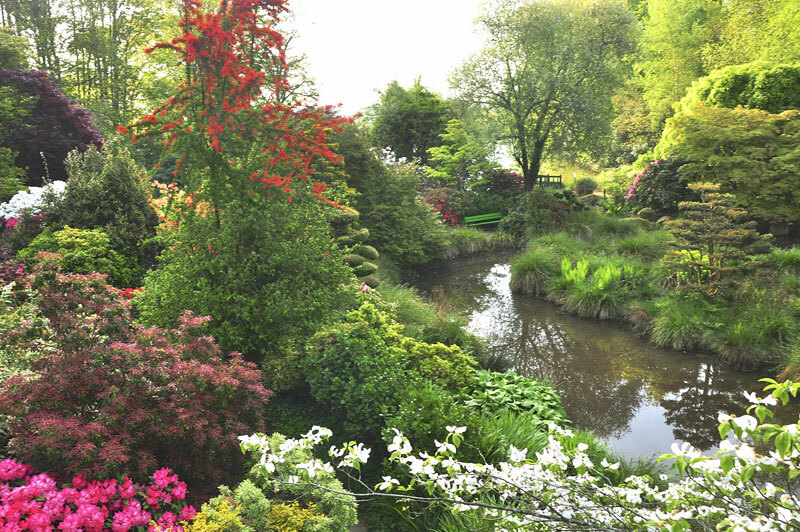 This garden is enveloped by the melody of the water and the colours and fragrances of the flowers. The Ancient City or the Garden of Alcinous: Three of the four central quadrangles surrounded by juniper trees create a setting for the garden. Classical columns covered with climbing roses define the overall scene. The fourth quadrangle has retained its original function as a vegetable garden. A herbaceous border surrounds the old city like a frieze, bringing life to the predominantly green avenues. The City of Knossos echoes the walls of the ancient city. This musical labyrinth, which enables visitors with impaired vision to find their way through the garden, is an invitation to discover an extensive collection of camellias. The Bamboo Grove is a maze of rooms which open onto a lotus-covered water basin decorated with three pyramids covered in dwarf bamboo. An impressive flight of steps leads to The Secret Garden. It draws on the mediaeval tradition of the “giardino segreto”, a “green room” of vegetation. The Path of Ancient Roses tells the story of roses, beginning with the first known specimens from ancient times and continuing to the beginning of the 20th century. It also tells of diverse breeds and cross-breeds which remain a secret – a magnificent story which is underlined by the natural beauty of these bushes and their blossoms and fragrances. Shrubs and herbaceous perennials alternate in the Garden of Dionysus: wild vines soften the rectangular fencing at the entrance. Four circles in the Garden of Olympus symbolise the twelve Olympic gods and goddesses, and the daughters of Zeus: the twelve hours, the nine Muses and the three Graces. Opposite Olympus is a representation of the box which Zeus gave Pandora and which contained all the evils of humanity as well as hope. The Prehistoric Garden is a reminder of the flora of the Cretaceous period 100 million years ago, before the extinction of the dinosaurs. The Garden of the Rising Sun is a combination of stones, water and vegetation. It is cradled by the sound of a waterfall. The focus here is on the abstract beauty of nature, plants and stones. The trees are works of art which are constantly trimmed into shape. A path laid out in the “V-formation of geese in flight” guides the visitor from the red bridge to the granite lantern. Three aspects of Japanese garden design are cited: the promenade garden, the Zen garden and the tea garden. The Garden of the Blue Source is laid out around a pond. Herbaceous perennials in various shades of blue thrive here. They are symbols of absolute love and the quest for eternity. The Garden of the Four Seasons is designed to create atmospheric views for the visitor, whatever the season. Four flowerbeds represent the four seasons. Four paths with Japanese stepping stones enable visitors to touch the “tree of love” on their 20th, 40th, 60th or 80th birthdays. The Path of Roses is bordered by modern roses with a special charm, intense fragrances and a wonderful abundance of blossoms. The Altar of Evening Harmony is home to a collection of azaleas and pink “moschata”. A tetrapylon at the centre offers views of the adjoining gardens. Hidden in a clearing of the small wood of “confidences” is The Garden of Starry Nights. The yellow corollas of day lilies are scattered like stars across the dark foliage in this central sanctuary. Collections of Agapanthus, Crocosmia, Echinacea and peonies planted in small square beds flourish in the Garden of a Summer Night’s Dreaming. The Garden of the Red Moon consists of peonies and shrubs which turn deep red in autumn. The Garden of the Setting Sun – a mirror reflection of the north façade of the château – is bathed in the light of the setting sun. A gentle slope in the shape of a circle arc is planted with intense yellow blossoms. Opened daily from March 1. to November 15. In July and August from 10.30 a.m. to 6.30 p.m.
From April to June, and in September from 11 a.m. to 6 p.m. In March, October and November from 2 p.m. to 5.30 p.m.